The Eliades brothers in their restaurant. One of Sioux City’s best known restaurants is about to mark a major milestone. The Milwaukee Wiener House opened near the Milwaukee Railroad Line in 1918. In 2013, the restaurant closed its original location to make way for the Hard Rock Casino and reopened a few months later in downtown Sioux City. 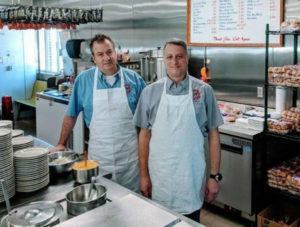 John Eliades and his brother, Mike, have run the place for a quarter of a century, serving a lot of repeat customers. Eliades says former Sioux City residents often pop in, too. Eliades’ father and a business partner ran the business from 1960 until 1993. Mike Eliades says the celebration to mark the 100th anniversary of the restaurant starts next Monday. The brew is being provided by a nearby tavern in Sioux City. On Friday, the 26th, hot dogs at Milwaukee Wiener House will go on sale for 100 pennies. The Wiener House is known for its classic “Coney Island-style” hot dogs topped by homemade chili and raw onions.